What kind of pulpit should you get for the church? 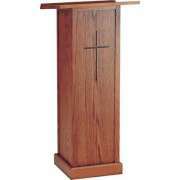 Church podiums come in both modern and traditional styles, and the right one should match your sanctuary. 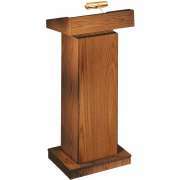 Your speech will be that much more memorable when given behind a church pulpit from the Hertz Furniture collection. 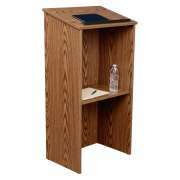 If you are looking for something with convenient built-in features, we have a number of enhanced church podiums. 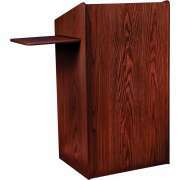 The efficient design of our multimedia lecterns will keep your equipment functioning properly. 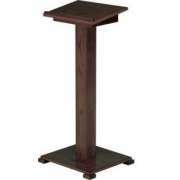 If you have a large sanctuary or congregation, we also have some great sound lecterns. How can I find a pulpit that fits my sanctuary? 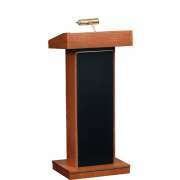 All of our church podiums have an attractive appearance. We have a number of different styles and materials so you can choose the model that matches your sanctuary and style. 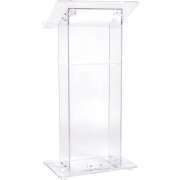 If you prefer a more modern appeal, our acrylic lecterns have a light and airy feel that will frame your speakers beautifully. 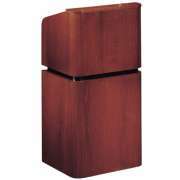 If you prefer a more traditional wood finish, wooden lecterns are available in wide selection of hues. All of our options will frame your clergy members beautifully and look great up there on the church stage. What features will make the podium more comfortable? Not all church pulpits have the same features. An angled reading surface is helpful to speakers because it makes it easier to read notes. Most reading surfaces include a book stop which prevents materials from sliding off. 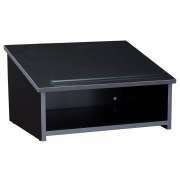 Some models even include a slide-out side shelf where you can put a laptop or audio-visual equipment. This is a great feature to have if you want to have multimedia presentations or events in the chapel. Shelves are another useful thing to have in your church pulpit. Some clergy members might like to bring books and other source materials to use in a sermon, and shelves provide an excellent place to keep everything. Without shelves, the alternative is to stack everything on the reading surface of the church pulpit which will distract the congregation and might even block the speaker as well. A big stack of books can easily get knocked off of the surface, creating an unwanted interruption during the sermon. How can I make sure the congregation hears the sermon? Any house of worship can benefit from an excellent sound system as part of the pulpit furniture. 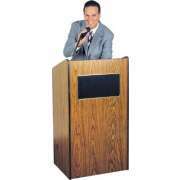 Great speakers enable everyone to hear, whether there is a small crowd or a packed house. A church lectern with a built-in microphone and sound system ensures that speakers have a comfortable place to stand while addressing the congregation, and enables them to reach everyone without straining their voices. 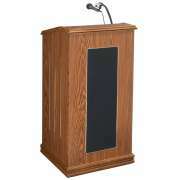 Sound lecterns become even more convenient when endowed with extra features. 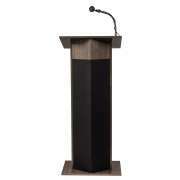 To ensure that clergy members and congregants of any age are heard, consider an adjustable-height sound podium. 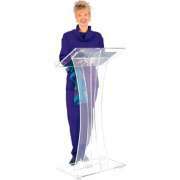 Our models also include hands-free microphones which are mounted to lecterns so speakers don&apos;t have to worry about clip-ons falling off of shirts or holding anything throughout their speeches. Making sure that your church furniture has the technology you need is very important for the modern house of worship. Microphones and speakers can totally transform the experience of clergy members and congregation. If you want to keep up with the times and really impress your members, consider a multimedia church lectern. These convenient pieces enable you to utilize laptops, slide projectors and more for a truly technological production. Even if you usually prefer classic speeches where the pastor reads a speech to the congregation, multimedia lecterns are good to have around for slideshows and special presentations. How can I save space and still have a nice pulpit? 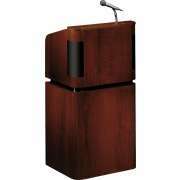 While full-height podiums are great, they can sometimes take up a considerable amount of space, making it difficult to accommodate other pulpit furniture. 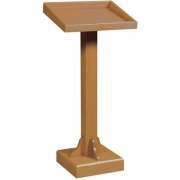 Our tabletop lecterns can transform any table into an attractive and functional speaker podium, while saving you space. 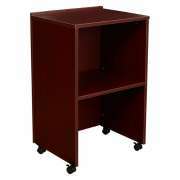 Lightweight portable lecterns are another great choice if you need something that is easy to move from place to place. Both of these options are great for occasions when a sermon is given in the middle of the service, because they are easily set up and whisked away. 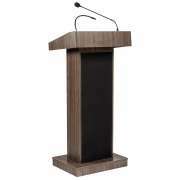 A great church podium can really help a speaker stand out and draw the respect they deserve. 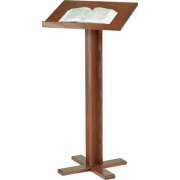 Hertz Furniture has a great selection of lecterns that will provide clergy members with a comfortable platform for sermons and coordinate with your other church furniture. The Hertz Design Center is here to help you if you have any questions about particular models, or you need help choosing the right podium.